Imagination has always been the spark in literature that establishes domain over the hearts and consciences of mankind. Love and the search for it has been the impetus for so many characters and the motivation for so many recorded works that it is hard to find anything entirely new, different or previously unseen. We are jaded in that way. Our expectations are rarely exceeded, but when a work comes along that forces us to re-examine something familiar and then takes us into an entirely different direction, we pay attention. 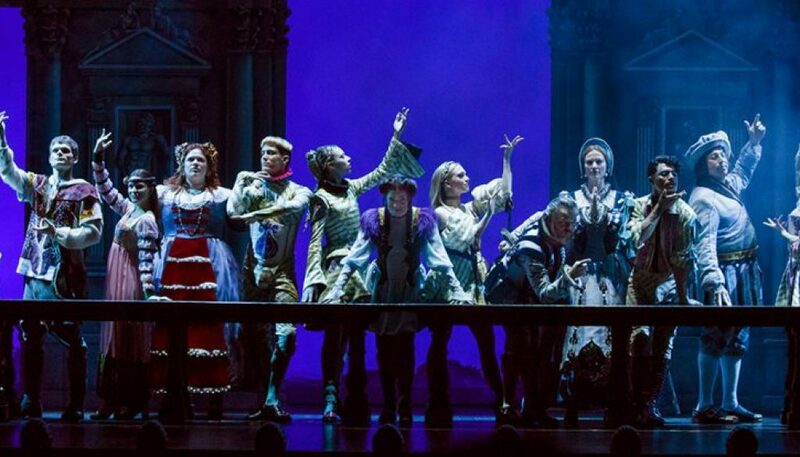 The new musical Head Over Heels, possesses an original book by Jeff Whitty which is based on Sir Philip Sidney’s “The Arcadia” and adapted for the stage by James Magruder. 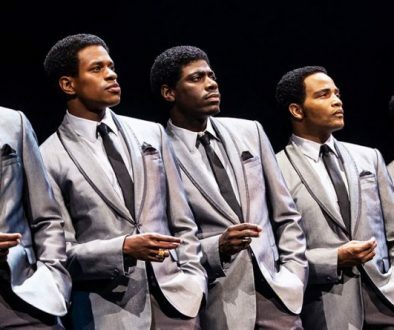 With popular music by Eighties heartthrobs The Go-Go’s, it is likely the oddest of pairings on Broadway. Yet, despite its seeming incongruity, this piece works on so many levels. 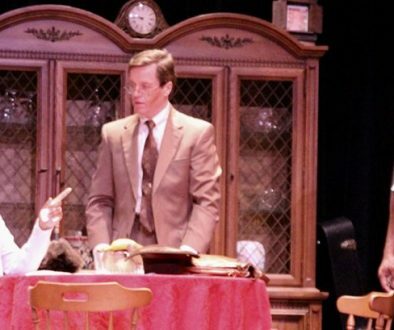 First of all, from the opening number, the music of The Go-Gos permeates the stage with powerful rock rhythms and lyrics, which advance the plot and fit as snugly as a glove in telling the story from scene to scene. Second, the energy of the actors is palpable. 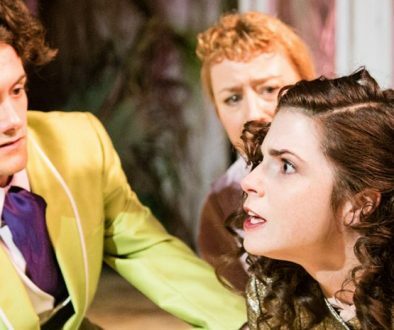 As the King of Arcadia, Basilius (Jeremy Kushnier) plays the heavy and is nicely paired with Gynecia, his wife and queen (Rachel York). 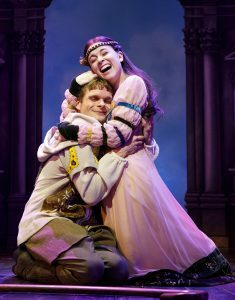 The comic foil is the role of Musidorus (Andrew Durand), the object of desire of both the queen and the king, once he dons a disguise as a means to pursue their younger daughter, Phioclea (Alexandra Socha). Yes, in Sidney’s original work written in the Elizabethan Age, the device of cross-dressing a main character, which was later used by Shakespeare and notably seen employment on the Broadway stage in productions like A Funny Thing Happened on the Way to the Forum and Charlie’s Aunt, is an integral part of the book’s plot. In today’s modern era, cross-dressing, as Dr. Frank-N-Furter famously says in The Rocky Horror Picture Show, is “the cause, but not the symptom.” Head Over Heels takes the original story with binary sexuality and spins it out into alternative and non-binary permutations. Nowhere is this seen better depicted than in the role of Pythio, the Oracle of Delphi (Peppermint), who is the first trans woman to originate a principal role on Broadway. Peppermint is a powerhouse, an engaging over-the-top performer who owns every inch of the stage when she is on. It is her prophecies that propel the story ahead, putting the king and his viceroy Damatas (Tom Alan Robbins) into fits of worry about the future of the kingdom. Bonnie Milligan, as the royal couple’s oldest daughter Pamela, undergoes a sexual awakening even she does not see coming, but for which the audience is one step ahead. Damatas (Tom Alan Robbins) has a daughter, Mopsa (Taylor Iman Jones), who arrives on the scene and establishes her own wants and desires, most of which involve Pamela. While the show takes off as in predictable fashion with Sidney’s original plot, it really becomes much more fun as the characters pursue each other with today’s sensibilities and tolerance towards love and unions. Musidorus, as both a man and in disguise as a woman, is pursued by both king and queen, but the object of his affection, Philoclea, is only approachable when he appears in women’s garb. This creates problems for the couple as to how the outside world will view their pairing as much as Pamela and Mopsa’s. The aptly-titled musical Head Over Heels really does deal with love and acceptance of its many shades. When one is in love, one will do anything, it suggests. And even Pythio has history with Damatas, we learn. 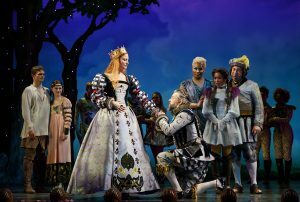 The world premiere of this musical occurred at the Oregon Shakespeare Festival in 2015 under the artistic direction of Bill Rauch and executive director Cynthia Rider. Not surprising, the show transferred to Broadway after enjoying a spectacular spring run at the Curran Theatre in San Francisco, a city known for advancing liberal ideas and alternative lifestyles, where it was warmly received. Along with the incredible music of The Go-Gos, ably conducted by music director Kimberly Grigsby, comes superb orchestrations and arrangements by Tom Kitt. Even though The Go-Gos original music was essentially a statement that women could create rock every bit as genuine and as forcefully as men, their music is not transformed into a melange of Broadway reorchestrations. The songs can stand on their own and truly inform the larger work. Also, Spencer Liff’s choreography is beautifully executed. In every scene where there is music, there is an accompanying movement that enhances the action on stage until the spectacular and dizzying finale. Speaking of the finale, stick around. There’s an incredible reveal that will make the hearts of longtime Go-Gos fans soar. Scenic design by Julian Crouch and period costumes by Arianne Philips are both sensational and colorful. Lighting design by Kevin Adams and sound by Kai Harada are also noteworthy as are the hair and makeup by Campbell Young Associates. Indeed, the entire creative team and cast are showing the Broadway world that there is something new under the sun to be seen, even if it involves themes that go back to the times of Shakespeare. 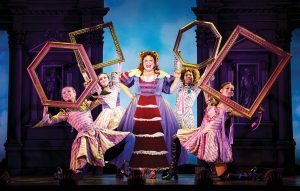 Head Over Heels, produced by Gwyneth Paltrow and others, is making the Hudson Theatre a special place to be this season. 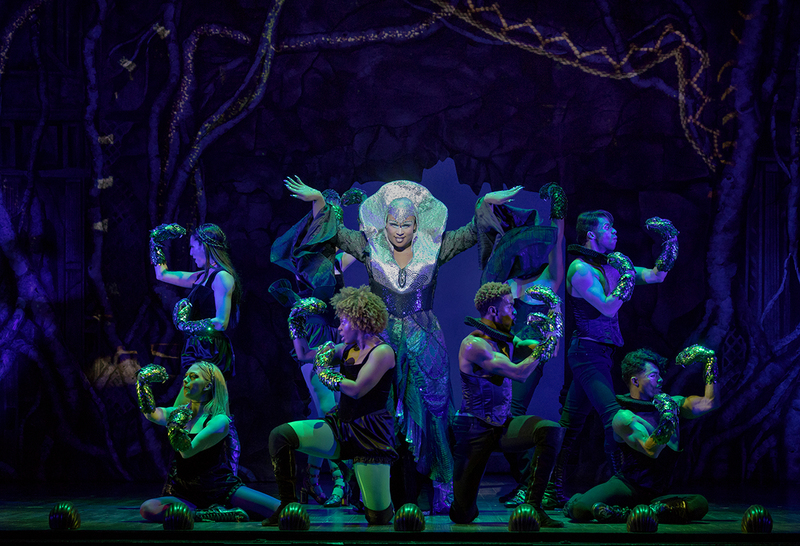 Heads Over Heels, directed by Michael Mayer, opened on Broadway July 26, 2018 and continues at the Hudson Theatre, 141 W. 44th St. in New York. For tickets click here. For more information, call 855-801-5876.